Butch's girlfriend is a human girl living in Los Angeles, Earth. 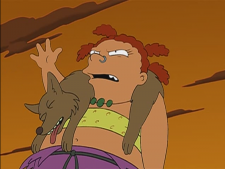 She is the girlfriend of Butch, the leader of a gang of armed kids that, in 3002, [2ACV19] encountered Fry and Michelle, who believed they were in a post-apocalyptic wasteland in the year 4000. Is Jewish, as is the rest of her gang.